This soup has a variety of flavorful and aromatic spices. 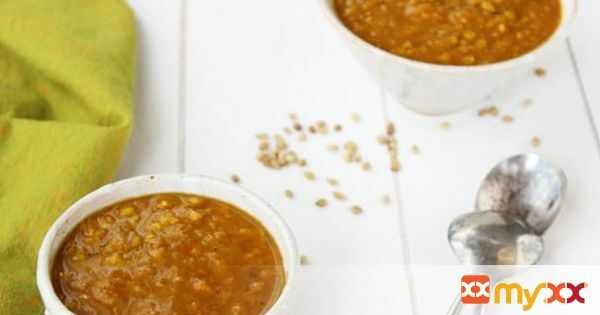 It is a vegan soup bursting with flavor! Serve it with our Coconut Rose Jasmine Rice for truly unique meal. 5. In a sauté pan add Grapeseed Oil, Coriander Seeds (you can put the seeds in a coffee grinder if you prefer) Cumin Seeds, Turmeric, Garam Masala. 6. Sauté on medium heat until fragrant approximately about 5 minutes. 7. Mince Serranos, grate Ginger, mince Onions, mince Garlic and add to pan then sauté until Onions are soft. 8. Add Tomato Sauce and cook on medium low for about 10 minutes then add to cooked Lentils and cook for 20 more minutes on low heat. 9. If you like a smooth texture to your soup you can put all of it in a food processor (blender or hand blender) to puree` or only use half for a slightly textured soup or leave it if you like it that way.